building a new Master Data Office, which will be transformational for the organization. The Manager of Business Information will be an important leader in this new group, both on the team and across the organization. This person will oversee a team of business analysts supporting the reporting and data needs across the organization in addition to strategic corporate initiatives. He/she will work directly with the Business and our IT partners on critical cross functional projects that will impact the future of the business. o Oversee the day to day activities of the Business Analysts based in the New York Buying Office. o Coach and develop direct reports in elevating approach to reporting and data, providing interpretation and analysis that is objective and action oriented. o Provide input and guidance on business requirements documents, test plans and overall solutioning for reporting projects. o Ensure project time-lines are adhered to and any delays are communicated in a timely manner. o Develop partnerships acting as a liaison between the technical and business teams to understand, troubleshoot, interpret and provide guidance on reporting and data needs. o Facilitate meetings; issue tracking/resolution, escalation etc. as you follow a report/data request from submission through to delivery. o Lead training classes, collect user feedback, and support the users as needed. o Lead post deployment validation as instructed by project leadership or management. o Gather and document business requirements for report and data requests. o Ensure compliance with data and reporting standards, roles and responsibilities. o Lead creation and review of all test-related deliverables including test approach, test scenarios, test cases/conditions, scripts and results. o Develop training materials and job aides to support reporting rollouts. o Identify and mitigate any project related risks. • Requirements: Consistent timeliness and regular attendance. Job requires ability to work in an office environment, primarily on a computer. The job also requires sitting, standing, walking, talking on the telephone, attending in-person meetings, typing, and working with paper/files, etc. • Occasional Requirements: Job occasionally requires bending, kneeling, reaching, and lifting up to 10 pounds. • May also require occasional driving and/or traveling overnight for business functions or site visits. • Vision requirements: Ability to see information in print and/or electronically. 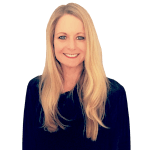 Tara joined the Connors Group team in 2018 as Recruiting Director, Retail, Apparel, Beauty & Luxury Industry Specialist. She believes clients value a recruiter who is curious, fast, efficient, honest and a brand ambassador. They want to ensure that the candidate they are getting is the right fit for their brand or business. Because Tara has been in retail in many different roles for 26 years, she offers the ability to anticipate the questions a candidate may ask, so that she can interview like a subject matter expert. As the candidate's very first interaction with the company, it is critical to represent the brand and company in the best way possible. Tara knows candidates value a recruiter who is friendly, honest, has exceptional follow-up skills and gives sound career advise. She understands the ins and outs on how to run a business from both a sales perspective and operational perspective. Knowledge of the roles she recruits for allows her to quickly assess if someone is right and ready for the role. And because she has also been the "candidate," Tara appreciates the importance of follow-up. There is nothing worse than experiencing radio silence after you've gone through the interview process. Good news or bad news, she won't leave you guessing. Tara is most proud of her legacy of talent, possessing the ability to identify, select and retain top professionals. She has developed and coached individuals on a consistent basis, and nothing gives her greater satisfaction than watching teams succeed and move on to bigger and better things! She is also proud of the fact that she opened 17 stores with e.l.f. Cosmetics in a year and half. In her over two years with e.l.f. she helped create and structure how the stores run today, from both a service and staffing perspective, to the operational way in which they function. Really having to become a jack of all trades; she is very proud of what was accomplished there. A career goal is to be seen as an HR expert in the recruiting field. Tara wants to leverage her experience in running stores, HR and Learning & Development to reach a broader scope of candidates. Her desire is to build trust with the hiring managers and HR so that they think of our company first before going to any other recruiting firm. In speaking to some fun facts, when not at work, she likes to spend as much time outdoors as possible; and loves to run, bike, hike and ski. A Long Island resident, Tara is a lacrosse mom and can be found on the field every weekend cheering on her 3 kids. Her husband is a Battalion Chief for the FDNY in the Bronx. Tara also loves sitting on the beach while reading a good book!